Set up your easel and stretch your canvas, Sky Arts is opening a fresh tube of paint to search for a talented artist who can be crowned Sky Arts Portrait Artist of the Year 2014. Following the enormous success of the first series, Joan Bakewell and Frank Skinner will return to present Sky Arts Portrait Artist of the Year 2014. They will be joined by the judges; award-winning portrait artist Tai Shan Schierenberg, former Head of Exhibitions at the Royal Academy and the National Portrait Gallery Kathleen Soriano and Kate Bryan, Head of Contemporary at the Fine Art Society, in the search across the UK and Ireland for a new star of the art world. The competition will be filmed over the summer and broadcast on Sky Arts in October. The series finalists will not only receive a year’s supply of Cass Art materials, but they will see their work exhibited at the National Portrait Gallery for a month and the winner will be awarded a £10,000 major commission for the Scottish National Portrait Gallery. The prize commission will be exhibited at the Scottish National Portrait Gallery and will become part of its permanent art collection. 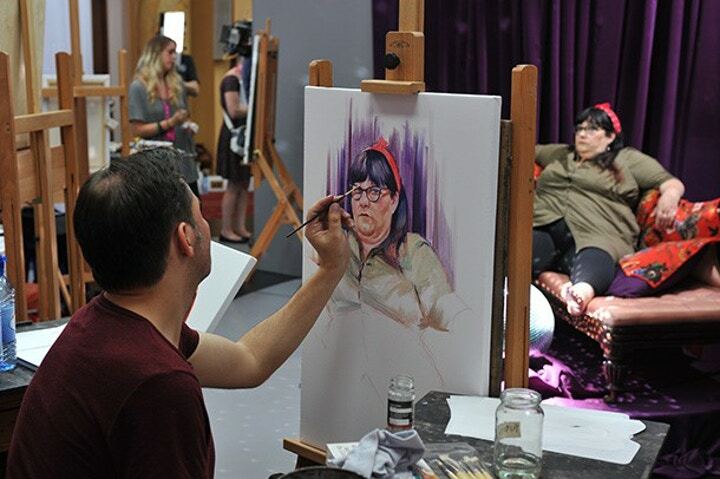 Sky Arts Portrait Artist of the Year 2014 will aim to discover and nurture artists of all capabilities who want to showcase their skills, whether amateur, professional or hobbyist. Anyone aged 16 and over is invited to apply. Shortlisted artists will be invited to attend one of six regional heats over summer 2014. At these heats, participants will be challenged to produce a portrait of one of three famous sitters. At the end of each heat the judges will choose one artist to go through to the next round of the competition. Members of the public are also welcome to come along and watch the competition in action. The winners from the heats will then take part in more extraordinary portrait challenges with the semi-final to be held in London and the grand final taking place at the National Portrait Gallery. The overall winner will be chosen by the series’ judges together with Sandy Nairne, Director of the National Portrait Gallery. Got some questions? Check out our highlights of chatting to the 2014 judges and artists and be inspired to apply! If you think you have what it takes to be crowned this year’s Portrait Artist of the Year then you can apply by submitting your own self portrait on their website. The closing date is 6st May 2014 at 9am. What are you waiting for? Head to Cass Art’s online shop to pick up your supplies and keep up with the latest Portrait Artist of the Year news on twitter.